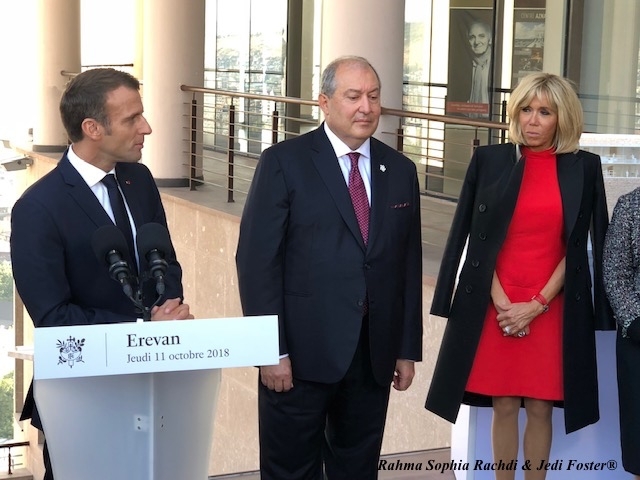 USPA NEWS - French President Macron and First Lady, Brigitte Macron, visited the Aznavour Foundation Centre to inaugurate the extensions of future projects. The Armenian President Armen Sarkissian was also here to welcome his French counterpart. The Centre, founded in 2007, by Charles Aznavour French-Armenian singer who passed away, on October 1st, was the son of Armenian migrants who immigrated to France, decades ago. President Macron, expressed, very moved, his admiration to this singer who became one the most influential French singer of all time. 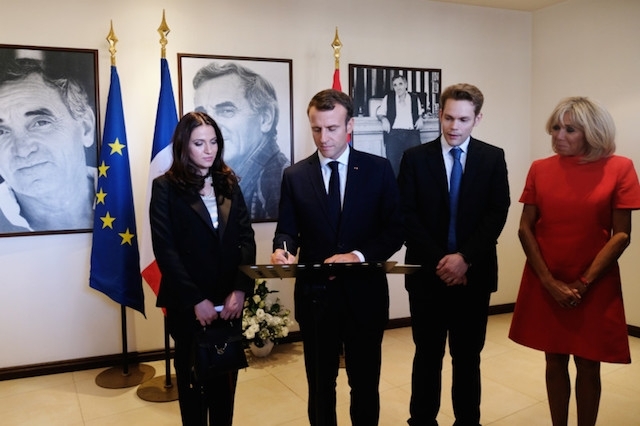 Charles Aznavour should have been part of the delegation accompanying the President Macron for the summit of the Francophonie in Yerevan, but fate has decided otherwise ... And it is Nicolas Aznavour, the youngest son, who welcomed the president , and the First Lady, Brigitte Macron. "He is not at the rendezvous, but he would have wanted it so much": regretted the President Macron Charles Aznavour, with emotion by the son of Charles Aznavour, who died last week. 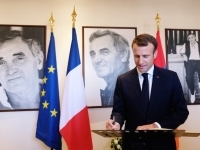 President Macron paid a new tribute Thursday to the singer in his center created in Yerevan to "strengthen Franco-Armenian ties". 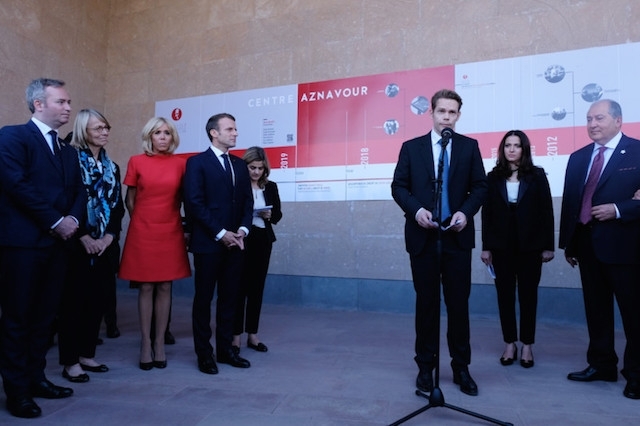 French President Macron and First Lady, Brigitte Macron, visited the Aznavour Foundation Centre to inaugurate the extensions of future projects. The Armenian President Armen Sarkissian was also here to welcome his French counterpart. The Centre, founded in 2007, by Charles Aznavour French-Armenian singer who passed away, on October 1st, was the son of Armenian migrants who immigrated to France, decades ago. President Macron, expressed, very moved, his admiration to this singer who became one the most influential French singer of all time. 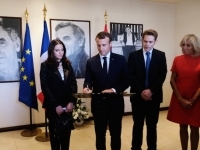 Charles Aznavour should have been part of the delegation accompanying the President Macron for the summit of the Francophonie in Yerevan, but fate has decided otherwise ... And it is Nicolas Aznavour, the youngest son, who welcomed the president , and the First Lady, Brigitte Macron. "He is not at the rendezvous, but he would have wanted it so much": regretted the President Macron Charles Aznavour, with emotion by the son of Charles Aznavour, who died last week. President Macron paid a new tribute Thursday to the singer in his center created in Yerevan to "strengthen Franco-Armenian ties". 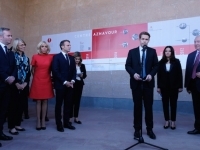 The Aznavour Foundation centre planned to be extended should be a center for "learning, exchanging and create in French" according to the wish of the French President Macron. A CENTRE WISHED FOR « LEARNING LEARNING EXHANGING AND CREATNG IN FRENCH » MACRON SAID The project was unveiled today at a ceremony attended by the President of France Emmanuel Macron and the President of the Armenian Republic Armen Sarkissian, as well as many figures from the political and artistic spheres. During the event, both parties signed a letter of intent to establish the Institut Français within the centre, which will provide courses and diplomas in French that are recognized in France.------------------------------------------------------------------------------------------- The Aznavour Centre will open its doors following a complete renovation of the building, to be undertaken by architect Aris Atamian. The monument will house an interactive tech museum focused on the life and career of Charles Aznavour, as well as a cultural and educational centre focused on three disciplines: cinema, music and the French language.------------------------- A bunch of French-Armenian celebrities who traveled from France with the French President Macron, attended the ceremony of inauguration, amongst them, Jean Baptiste Lemming Secretary of State for Europe and Foreign Affairs, Patrick Devedjian, President of Conseil Department of Hauts de Seine, Andre Manoukian, musician, Tv animator, Youri Djorkaeff, Footballer… President Macron expressed his admiration for this legendary singer while regretting his absence today in Yerevan: "Everything was planned, he would have waited for us, with that deceptively relaxed air that was his." ---------------------------- The President continues to say that the most important thing is to maintain Charles Aznavour's "His State of Mind ". Niclas Aznavour, for his part, expressed his attachment to the committed battles of his late lament: "It is obviously a heartbreak for me to present the center without my father at my side", said, very moved, the youngest son 41 years old. "But I'm also grateful to be able to continue his fight." President Macron recalls how much the Franco-Armenian icon was appreciated by the French, but not only: "More than loved, adulated". 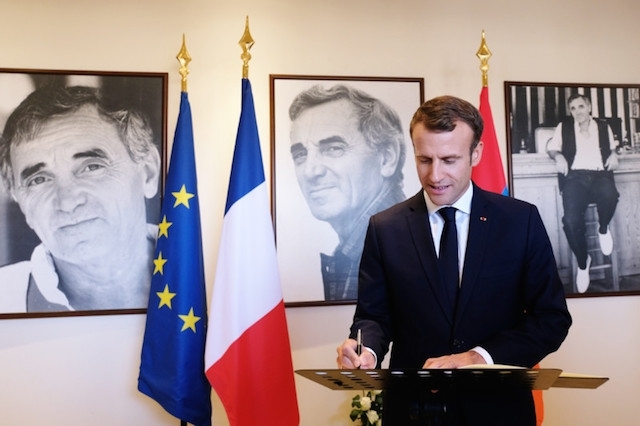 On this occasion, President Emmanuel Macron and his Armenian counterpart Armen Sarkissian signed a letter of intent to create a French Institute in the center to provide French language courses. Which will be partly taught on the basis of the texts of Charles Aznavour. Some 43,000 young Armenians are currently studying French, but "it's not enough," said Emmanuel Macron. 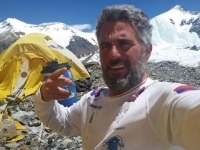 GUEST ARA KHATCHADOURIAN FRENCH-ARMENIAN-LEBANESE ATHLETE WHO CLIMBED THE EVEREST Ara Khatchadourian, was on of the special guests, who took an amazing new challenge. 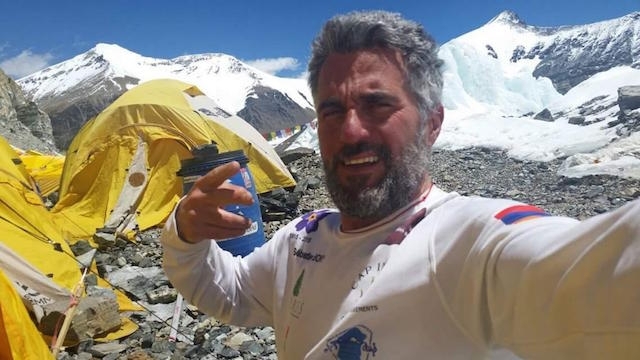 This highly renowned athlete, who reached the Everest on Mai 22nd at 8h30 am, before entering to another challenge under « RUN FOR PEACE » He explained that he came to Armenia invited by the President Macron, will return to Paris with him, tomorrow and shall be back to Erevan as a guest honor for the next Armenian Marathon next Monday. To do so, Ara usually follows an intensive training,during his marathons, so that every week he realizes: • 50 to 100km of running • 200km cycling • 15h of bodybuilding • 5 hours of meditation and yoga He is now the Official Ambassador of Marathon in Armenia for life. Amongst his successes, there are some of his challenges in a few figures Departure: early April Arrival: July Number of kilometers: 4350 Km; 1 marathon a day Number of days: 103 Number of countries to go: 8 Number of city to go: 150 Ara says he is a World citizen, such as Charles Aznavour used to say. Basically, Ara, is French-Lebanese-Armenian, and speaks all these languages and fell belonging to the three countries. AZNAVOUR CENTRE INAUGURATED IN 2007 BY SARKOZY WILL BE DEDICATED TO KNOWLEDGE AND CULTURAL EXCHANGE---------------------------------------------------------------------------------------------------------------------- As a true multimedia exhibition dedicated to the life and work of Charles Aznavour, the Centre’s museum will offer an extraordinary experience. Visitors will discover, guided by the artist’s voice, the most significant stages of his life, from his parents’ escape to his illustrious career. Along the way, visitors will be able to explore their own musical abilities by recording their songs and learning mixing techniques with experienced sound engineers.--------------------------------------------- The Aznavour Centre will also be dedicated to knowledge and exchange. In particular, it will house a 200-seats amphitheater designed to host master classes led by the renowned cinema, theatre and film experts, several of whom have previously worked with Charles Aznavour. Classrooms dedicated to learning the French language will also be made available to users. In addition to classical French language instruction, the Centre will offer courses using a learning method based on using text of Charles Aznavour’s songs. Visitors will also have access to a media library, a project made possible thanks to the support of the Institut Français, which will provide them with a wide selection of more than five thousand books in French, available on digital tablets.---------------------------------------------------------------------------------------------------------------------------------- WE ARE PROUD OF YOU NICOLAS AZNAVOUR, PRESIDENT MACRON SAID AS HE CHAIRS THE AZNAVOUR FOUNDATION--------------------------------------------------------------French President Macron and First Lady, Brigitte Macron, visited the Aznavour Foundation Centre to inaugurate the extensions of future projects. The Centre, founded in 2007, by Charles Aznavour French-Armenian singer who passed away, on October 1st, was the son of Armenian migrants who immigrated to France, decades ago. President Macron, expressed, very moved, his admiration to this singer who became one the most influential French singer of all time.------------------------------------------------------------------------------------------------- President Macron, reminds that Charles Aznavour, was an illustrious ambassador for France globally and , leaves behind a considerable philanthropic legacy. His efforts mobilizing assistance for the victims of the tragic earthquake that struck Armenia on December 7, 1988 left a lasting impression of his dedication to philanthropic work. The artist was also involved in the fight to cure cancer and Alzheimer’s disease and, more recently, mobilized to help victims of the earthquake in Haiti. “France and Armenia are united by a long-shared history, of which the 17th edition of the Francophonie Summit, held in Yerevan this week, is a striking symbol. With the foundation, Charles Aznavour wanted to build a bridge between France and Armenia. In this way, he took a new step forward in his philanthropic work, by committing himself to the promotion of culture, in parallel with his social action. We will pursue its mission even more vigorously than before, in his honor and in his memory” says Kristina Sarkisyan, CEO of the Aznavour Foundation. RMENIAN PRESIDENT SARKISSIAN PAYS A TRIBUTE TO CHARLES AZNAVOUR ENCOURAGING NICOLAS TO CONTINUE THE PROJECT--------------------------------------------------------------------------------------------------------------- Nicolas Aznavour, co-founder of the foundation, explains: “It is obviously heartbreaking for me, as it is for everyone at the foundation, to present the Aznavour Centre without my father at our side; but I am also deeply grateful to be able to continue his battles in this way. I would like to thank the countless people who have supported us over the past few days, through their words and donations”.---------------------------------------------------------------------------------------------------------------------------- As a widely celebrated and hugely talented artist, simultaneously an actor, songwriter, performer and beloved public figure, Charles Aznavour will be missed by his audience and the artistic community. 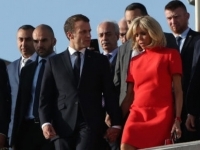 Through the foundation and its future projects, the values of love, generosity and humility that he embodied will live on.--------------------------------------------------------------- PRESIDENT MACRON AND WIFE BRIGITTE TAKE A WALK DOWN THE CASCADES OF EREVAN’S CITY CENTRE-------------------------------French President Macron and his wife Brigitte , decided to take a convivial walk down the Cascades accompanied by the French delegation, as the weather was sunny, just after the unveil fo Aznavour Foundation Centre’s uphill. Cascade is the mots up and coming, historical site fo Erevan, and must to visit.